Tidal Disruption events are no stranger to Astrobites, but don’t be mislead, these events are very rare. A tidal disruption event occurs when a star strays just a little too close to a supermassive black hole. In these events, the differential pull of the gravity from the black hole on the closer and farther side of the star (the tidal force) is so strong that it exceeds the self-gravity of the star. As a result of crossing this boundary, a star literally gets ripped apart. Much of this left over stellar material will then get accreted by the black hole. As this occurs, the matter heats up to millions of degrees and emits high energy photons in the X-ray. For an excellent overview of the physics of tidal disruption events, see Nathan’s post. So why are tidal disruption events so interesting? In general, these events are direct probes of accretion physics, but tidal disruption events are also interesting in the context of galaxy evolution. Black hole growth is a phenomenon which isn’t entirely understood. Having an observational constraint as to how important stellar tidal disruption is to black hole growth would be very helpful (although difficult since these events are quite rare). Furthermore, these events could help astronomers determine how many small galaxies contain black holes. The estimates vary, but this paper suggests a relatively small black hole like the one in the Milky Way can only disrupt ~50 stars in the next million years. What makes this assertion particularly interesting is that a relatively quiet, small supermassive black hole like the one in our own Galaxy would be nearly impossible to find if it were further away; however, if a tidal disruption event occurs, a supermassive black hole must be involved. That means if we observe these events in small galaxies, we know they must house a black hole at their center. The authors of today’s paper did most of the work using archival data of Abell 1795 (A1795), a galaxy cluster in the Abell catalogue. The authors examined a large number of data sets, from optical to X-ray, to characterize the properties and scope of this possible tidal disruption event. The key data set in this analysis is the archival X-ray data, obtained over ~12 years using both Chandra and XMM-Newton; however, other data sets are important to characterize the properties of the host galaxy and ensure this event is not due to a background or foreground object. Maksym et a. figure 1. 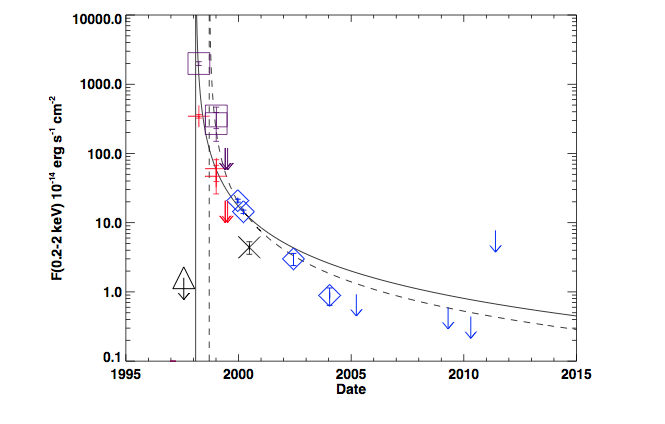 This figure shows the X-ray brightness of the A1795 flare source with time. 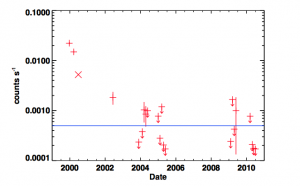 The source is over 100 times bright in 2000 than in 2010. The blue line indicates the median detection limit for the Chandra 2-8 keV band. The X-ray data sets easily identify this A1795 source as an X-ray transient as can be seen in the figure to the right. In this figure, the Chandra count rates for this object vary by more than a factor of 100 between 2000 and 2010. However, tidal disruption events are not the only type of events to cause bright X-ray outbursts. Other culprits are active galactic nuclei, supernovae, gamma-ray bursts, and flaring M-stars. Many of these other scenarios are much more common than tidal disruption events, so the authors need to rule out these more common astrophysical X-ray outbursts in order to suggest the A1795 outburst occurred because of a tidal disruption. 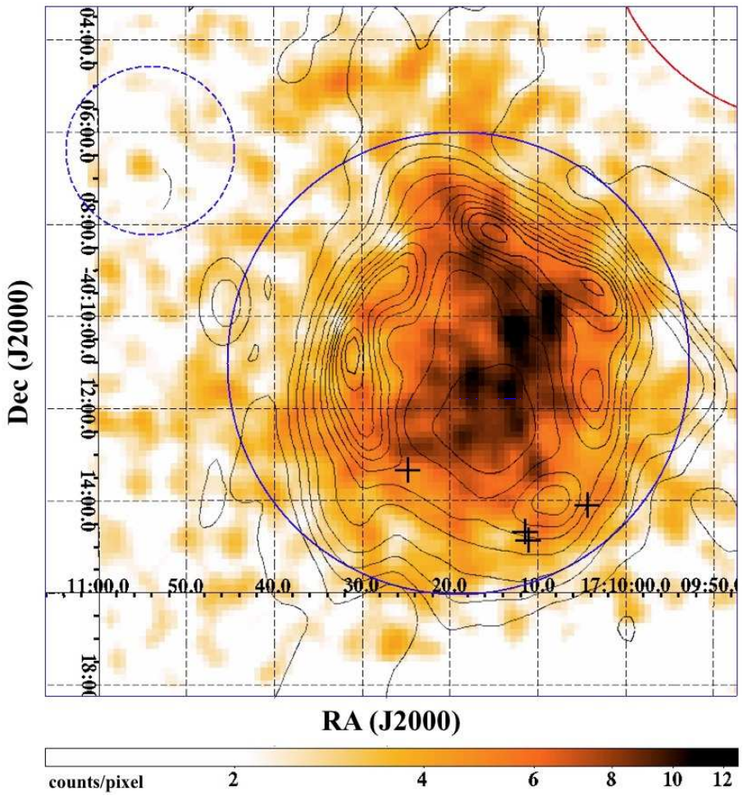 In order to investigate whether the A1795 flare source could be another astrophysical X-ray flare source, Maksym et al. 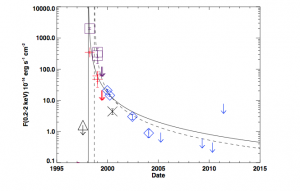 first need to verify that the flare actually occurred in the Abell 1795 cluster. In optical data, the authors verify that a very faint galaxy is spatially coincident with the X-ray flare source; however, this does not mean that this galaxy is at the same distance as the Abell 1795 cluster. For example, the host galaxy could be a very bright galaxy which is much further than the Abell 1795 cluters, but happens to be on our same line-of-sight. To test this, Maksym et al. obtained a spectrum of the host galaxy; however the data were too low quality to conclusively measure the redshift. Maksym argue that the galaxy color, brightness, and distance to cluster center of this dim host galaxy strongly suggest that it is a member of Abell 1795, although they suggest follow up observations of this source to determine not only its distance, but also many more of its properties. Once they established that the host galaxy is likely in Abell 1795, Maksym et al. could rule out a number of scenarios based upon the total brightness of the event. For example, an M-star flare wouldn’t be nearly as bright as this event at this distance. But what if the black hole were simply accreting at a high rate, and is currently in a time of low emission? This is observed in active galactic nuclei, where black holes can accrete at extremely variable rates. Even in our own Galaxy, the central black hole, which is accreting very little, does so a variable rate. While this would be an extremely variable black hole, it isn’t out of the realm of possibilities. For this reason, the authors compare the spectrum they obtained of the host galaxy of the A1795 flare source to what is expected in a galaxy which has an active black hole. They find that the host galaxy has no hint of the emission lines expected in this case, thus the authors suggest this black hole is typically quiescent. Maksym et al. figure 9. This figure shows the time evolution of the X-ray flare source in Abell 1795 in comparison to models of the expected time evolution in a tidal disruption. The data and the model agree well. Having likely ruled out the other possibilities, Maksym et al. suggest the A1795 X-ray flare source likely occurred owing to a tidal disruption. Dubbing it a tidal flare candidate, they compare the X-ray flux to the expected time evolution of a tidal disruption event (shown to the left), and find that this event is largely consistent with existing models. While the models aren’t expected to be perfect, this is a nice sanity check for what we expect during a tidal flare. This is great news, because this is one of the best-sampled tidal flares of this type (e.g. no jets) to date. Furthermore, the very small host galaxy implies an interesting finding in itself — this could be one of the smallest extragalactic supermassive black holes discovered to date! This is very interesting, because while it’s well established that almost all large galaxies host supermassive black holes, it is unknown whether the same is true for smaller galaxies. For this reason, the authors suggest detailed follow up of the host galaxy properties. Chandra Observes Sgr A* Rejecting Material Where do supermassive black holes come from? SNoR-ED: Supernova Remnants I – Ejecta-Dominated Where do most planets form?